What if God was one of us…. As uncanny and as thought provoking the song may be, imagine another thought provoking scenario- Among all of us on this earth, YOU are given the privilege to be GOD? Lucky You!! Or so it seems at the first instant. For however exciting the opportunity sounds, it comes with its set of unique dilemmas. For starters, there are so many Gods in this world, .so which God to be? Without a doubt you deserve the best (after all , you are God). So why be any other God and why not be the best God? So the dilemma now reshapes itself into – To find which God is the best? Your dilemma is made even more difficult when you realize that you cannot approach anyone for advice. After all, every person would claim that the God he/she follows is the best God. After realizing that your Social Network will not be able to help you out on this one, you decide to try your hands at History only to discover that human history is tainted with the loss of countless lives in an attempt to put one God better than the other. But amidst all this bloodshed, History still fails to point toward a Supreme God among other Gods. Keeping History books into history, you decide to research a modern text. Maybe modern analysis can solve your dilemma .You get hold of the book, If world were a Village. The book tells you that if on this earth there were only 100 people — 33 would be Christians, 18 Muslims, 14 Hindus, 16 Non Religious, 6 Buddhists and 13 followers of other religions. Perplexed by your dilemma, you come up with an exhaustive solution – Study about each God that there is and then decide which God is the Numero Uno!. As comprehensive as the idea sounds ,let me warn you it is not a practical one. Just to give you the reason behind my apprehension , when you would reach Buddhism in your study, you will find the Buddha has 32 avatars. So you have to 32 avatars to understand the Buddha. Oh! What do you say – 32 is not such a big number. You can study the 32 avatars. Okay, But thrn let me tell you about Hinduism, The total Gods in Hinduism is 330000. By the time you would complete the study of their life, your life would be completed.. Case closed! You seem to be a bit lost now with all these approaches failing to give you an answer. Let me suggest you a compromise – Instead of choosing the best God , let us only decide to choose the best religion. It seems a more manageable prospect. It is also very closely related to the initial dilemma – after all , it was God only who gave religion to men and women ( Or was it the other way round ? Let’s not dwell into it , we have work to do ). And on top of other things, your decision would also help the whole human race. The whole race has been fighting among themselves for ages to prove their religion as supreme, May you can decide for them and settle the issue once and for all, And they are sure to agree with your decision ( after all you are God 1 )So let us work together and try to list down the major teachings of the various religions of the world. Then we will try to categorize the teaching into some categories so that we can analyse them in detail. So let’s get to work ………………………..
And there! !, we have the table ready below. 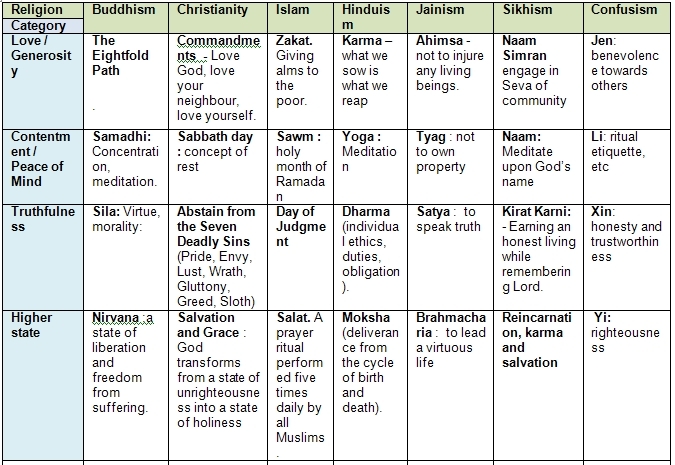 Now all we need to do is analyse and pick out the best religion. Yes, my friend, I am as shocked as you are — All the religions teach the exact same things via their respective Gods and via their own respective means ??!! But why then have humans been fighting among themselves since time immemorial l to prove that their religion and their God is better than the religion and God of others? Apologies my friend, I have no idea how to answer this new dilemma. But I have a feeling that the day every human starts taking the trouble to ponder over this question, the world would be a better place. Do you share the same feeling my friend? this is too much gyan for me….